I am Andrew Weins and I am the owner and operator of the Menomonee Falls, WI territory of JDog Junk Removal & Hauling. I also own and oversee territories in northern Chicagoland and San Diego. 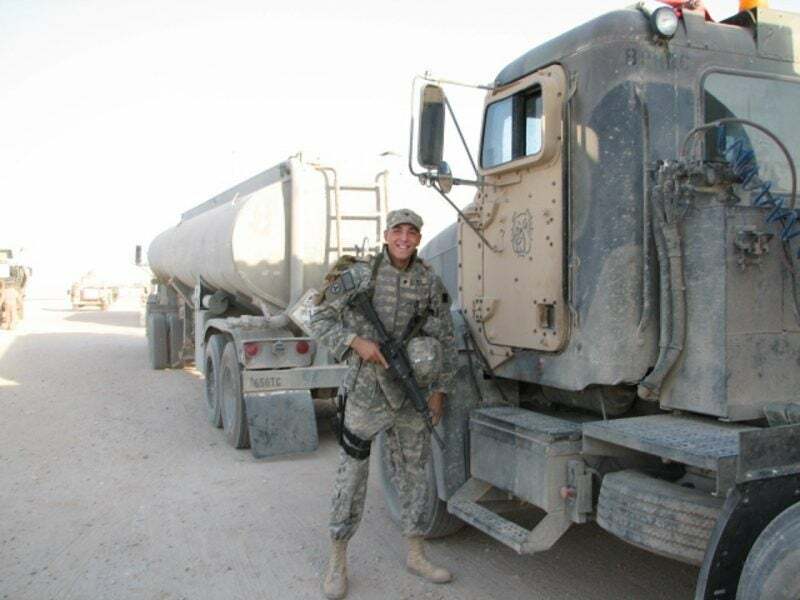 JDog is a national company that awards franchise territories exclusively to military veterans and veteran family members -- people who understand the notion of service to our country, hard work, and dedication. I currently employ 20 full-time employees and two part-time employees. I have served overseas in Iraq and Guantanamo Bay, Cuba. During my deployment to Iraq, I took part in 93 combat missions. I am currently serving in the United States Army Reserves as an Army Career Counselor with the rank of Sergeant First Class. I can’t say that there was a single moment, but as a platoon sergeant, it is the overall pride that comes from watching young soldiers develop into respectable, honest and good people. At the end of the day, I have more appreciation for being able to make an impact on someone’s life than I have for helping to liberate Iraq in one war. It’s the reason that I am still in the Army Reserves as an Army Career Counselor. I love it because I still have that romantic idea that what I do is for the greater good. How you impact those around you is really what’s important. What did being in the military teach you about risk in business? Being in the military taught me to risk it all early and to risk it all often. No matter how hard business gets, we are all coming home every night. The same isn’t always true overseas. Overseas, you give up your freedom to protect other people -- it sounds ridiculous in theory, but it’s who you become afterward that makes it all worth it. I used to look death in the face daily, so those experiences have certainly prepared me to take risks. I know that no matter how bad things get, I always have to keep pushing forward. As an entrepreneur, I have to put everything at risk every day. It’s remarkably easy to continue doing what you’ve done the day before and the day before that, but I have learned that if you’re not willing to take a risk, then you will stop growing and you will not be successful. To me, an entrepreneur is someone who is willing to work 80 hours a week for themselves before working 40 hours a week for someone else -- at half the pay. Entrepreneurship is at the core of what we do as Americans. Entrepreneurship is not a job or a title. It’s a feeling and a lifestyle more than anything. People ask me all the time -- do you ever not work? And frankly, the answer is no. An entrepreneur has to be ready to work at all times -- even if that means working at 9 p.m. on any given night. I’m not saying that entrepreneurs put their work before their families, but they do find a way to make both work together hand in hand. Sometimes when I pick up my three-year-old daughter I’ll drop by the yard to check in on the business. But I don’t do it just for the business, I also do it because my daughter loves seeing my guys and they love seeing her. We drive massive camouflage Jeeps, Hummers, and trucks -- so my daughter gets so excited to see what she calls my “dog dog Jeep”. So, I’ve learned to include my family in my work and I’ve created a balanced relationship between the two. An entrepreneur has the freedom to create his or her own work environment. So when I see something that I am working on succeed, I’m motivated to push forward and launch myself into what’s coming next. What should people understand about what they’ll get when they hire a vet, or go into to business with a Veteran entrepreneur? My employees, vendors and customers know that I am very direct and transparent. I’ve been described as “the tall loud guy who looks angry and swears a lot.” That’s pretty accurate, but aside from my tough exterior, I am willing to take the time to explain things and willing to go the extra mile to be flexible with my employees. My passion for what I do is what ultimately brings me success. I genuinely love what I do -- it would be amazing if everyone felt the way that I felt about my job. Is there a quote or saying that inspires you? I have a few quotes to live by. One I like is, “Never neglect an opportunity for improvement.” It is written on a sign that has been hanging in my parents’ kitchen for years. It taught me to realize that once I’ve gotten out of the “kill zone,” then I need to take the time to reflect and learn from my experience. How many times do we see opportunities and walk away from them? Every experience is an opportunity to learn and improve.